I'll share my project as soon as possible. Hope you like it community. Thanks to Lokki and John ! I would present them if I have time! I think I'll be having to send a few rings your way, mate! Well I was actually meaning a script. I guess it's not enough. Ooooh, I'd very much like to create a plugin for NodeBB so that you can log in with your ring. It'd be kind of like the SSO you guys have on here, except physical. I'm kinda leaning towards allowing anything that contributes meaningfully to the community. The main post says invention but what we want most is to take over the world... Or just make everything interact with a ring, be it through hardware or software. We don't want 30 copies of MrStein's exact car starter, but I'll allow 30 different ways of doing it! Software to utilise the ring would be excellent, I think that'd be great if you could set it up to do the single sign on thing @julian. @DogTag, I won't stop you from doing anything, it's just got to be worthwhile, something that benefits everyone in the community. I support @Lokki here. I think the real world impact of contributions are subjective and we really should encourage all experimentation at this point. I didn't think I said that out loud, @Lafunamor ... Drat. I've received a random handful of QA Visual Failed NFC Rings! Now is the time to start putting your hands up for projects, guys! Chop chop! Just to be clear, we want well written guides (with screenshots/pictures please!) for general use of the ring as well as other things like projects to build and software that utilises the ring for various things. Post in here and tell me what you're going to do, I want to see some action and need to give these rings to contributors! Don't be shy! @DogTag give us a guide with your script and make a seperate thread in here for it and I'll send you one! @julian if you write your plugin I'll do the same! 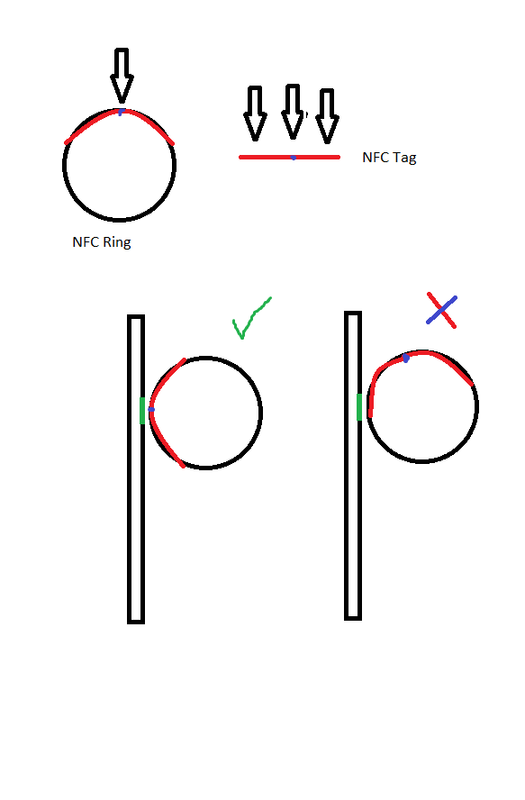 Do I get one for my Visual representation of how to orientate the ring to a phone through the medium of MSpaint. ahaha @NFCringTom worst mspaint ever, go download inkscape and embrace being awesome. I've started handing these ones out, MrStein will get a few, Nairod gets one (he's shown me his work in progress and where it's at and will do a full write-up and share shortly), and one of the visual fail + inlay fail rings has winged it's way towards a galaxy S5 for testing. If you want one, put your hand up for it, tell me what you'll do and lets make it happen!